Fox "...thay [sic] believe that the Government has treated them more harshly, and with Greater injustice, than any Other Indian nation" wrote Indian trader George Davenport to Illinois Congressman Joseph Duncan in February of 1832. Davenport was trying to explain the bitterness felt by the Sauk and Fox at white encroachment on the area around their principal village of Saukenuk, located at the site of present-day Rock Island, Illinois. While the Sauk and Fox were in no position to be objective about their mistreatment by the American government, they were not too far off base. The way in which they were stripped of their Mississippi Valley home easily holds its own with better-known tales of how whites used trickery, fraud, and finally, overwhelming force to sweep the Indian out of the way of the relentlessly advancing frontier. The Sauk were of Central Algonquian stock—Eastern Woodland Indians. Before 1700, they had been driven from Quebec by the powerful Iroquois, had settled first in Michigan, then moved westward to the vicinity of Green Bay, Wisconsin, where they had joined forces with their kinsmen, the Fox. Finally, they moved on to the Upper Mississippi Valley and, about 1760, they established Saukenuk on the Rock River about two miles above that pleasant stream's junction with the Mississippi. The Sauk were the dominant partners in the alliance, and Saukenuk itself evidenced how well they managed their affairs. It consisted of some one hundred lodges—neatly constructed, rectangular residences laid out in orderly rows on the low ground between the river and a seventy-foot high bluff. They were built with sturdy wood frames covered with strips of elm bark which, as one early settler put it, "turned the rain very well." On lowland along the river, the women raised corn, beans, squash, and melons. The rivers teemed with fish—the prairie groves with birds and small game—and the tribes' winter sojourn to their Iowa hunting grounds produced prodigious hauls of deer, beaver, otter, and raccoon pelts. Everything they had was shared by all, and British adventurer Jonathan Carver noted with surprise and admiration that the Sauk "esteem it irrational that one man should be possessed of a greater quantity than another, and are amazed that any honor should be annexed to the possession of it." Portrait of William Henry Harrison by Rembrandt Peale. They were also fierce and warlike enough to satisfy the most fevered Hollywood imagination, and they were at pains to look the part. The warriors' faces were painted in fantastic patterns of blue, white, yellow, and black. As if to taunt and defy their enemies, they shaved their heads close except for a bristling scalplock which would be adorned for battle or ceremony by a clutch of eagle feathers. War was the principal road to distinction, and tales of exploits by their elders, told and re-told, bred generations of young braves thirsting to prove their mettle. They found ample opportunity to do so in the series of wars in which the Sauk and Fox seized coveted Illinois, Iowa, and Missouri hunting grounds from their weaker neighbors just as they had themselves been ousted from their Canadian home by the powerful Iroquois. It was these wars that led Meriwether Lewis to observe that the Sauk and Fox, while "extremely friendly" to the whites, were "...the most implacable enemies to the Indian nations with whom they are at war; to them is justly attributed the almost entire destruction of the Missouries, the Illinois, the Cahokias, Kaskaskias and Peorias." Carver, perhaps seeking to reconcile his admiration for the Sauk's well-ordered community life with his dismay at their torture and execution of helpless captives, commented: "They are the worst enemies and the best friends of any people in the world." From the start, their relationship with the Americans was a rocky one. The Sauk had experienced French, British, and Spanish "fathers" and had accommodated, as events demanded, to the varying Indian policies of each. They had found the Europeans to be interested in the fur trade and in military alliances and free with presents and much-prized medals. The Americans were a different story. 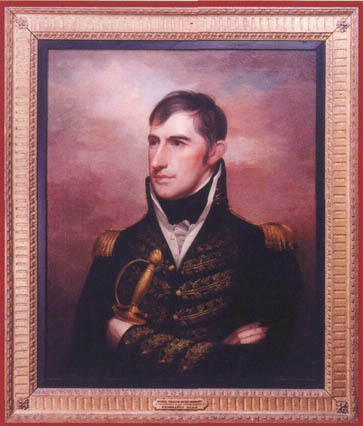 Henry Goulbourn, one of the British peace commissioners negotiating the Treaty of Ghent which ended the War of 1812, wrote: "Till I came here I had no idea of the fixed determination which there is in the heart of every American to exterpate [sic] the Indians & appropriate their territory." The Sauk version was that the Americans were like a spot of raccoon grease on a blanket; barely noticeable at first but spreading irresistibly until the entire blanket was ruined. 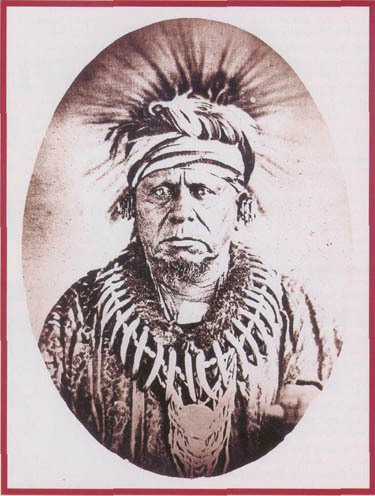 Late nineteenth-century copy of a photograph of Chief Keokuk. Similar images may be found in the National Anthropological Archives, Smithsonian Institution; The State Historical Society of Wisconsin; and Missouri Historical Society. either side of the Illinois River. Then, in August of 1804, an incident occurred which gave him the excuse for a much bolder stroke. At the Cuivre River, some forty miles north of St. Louis, white squatters had for some time been trespassing on Sauk and Fox hunting grounds. A fight had broken out between the squatters and some Sauk and Fox, and when it was over, three or four whites had been killed. One version has it that the killings were in revenge for the beating of an Indian who had tried to stop an American from taking liberties with his daughter. Others suggested that fiery young Sauk warriors committed the killings as an act of defiance toward the tribal elders for failing to stand up to the Americans. Whatever the actual facts, there was an immediate war scare along the frontier. Whites fled for protection to forts and blockhouses, and Sauk and Fox living near St. Louis retreated to the relative protection of Saukenuk. The worried Sauk chiefs sent two of their number to St. Louis to express their regret over the incident, to inquire what satisfaction the Americans demanded, and to express their hope (soon to be dashed) that their new father "would not punish the innocent for the guilty." What the Sauk chiefs actually expected, in keeping with the custom prevalent among their own and neighboring tribes, was that the Americans would demand payment in money or goods to "cover the dead," i.e., to compensate the families of the victims. They were considerably taken aback when advised that the murderers must be delivered up to white justice and that the Sauk must appear at a council with Harrison in St. Louis. No mention was made, however, of a contemplated land cession. On October 27th, another Sauk deputation appeared at St. Louis led by a minor chief, Quashquame, with three or four other members and with one of the supposed murderers in tow. The presumed culprit was promptly clapped behind bars, and Quashquame and his delegation spent much of the following week vainly pleading for his release— the rest of it forgetting their troubles in St. Louis taverns and grog shops. On November 3rd, confused, intimidated, and either drunk or hung over, Quashquame and the others were assembled before Harrison and his retinue. An interpreter read to the befuddled Indians a 2,000-word treaty between the United States and the Sauk and Fox to which the Indians were to subscribe by making their mark. as $60,000 in a single season, the deal was preposterous on its face. Quashquame, who spent the rest of his life being condemned as the man responsible for the misfortunes of the Sauk and Fox, always claimed that neither he nor his associates ever "touched the pen." More likely, he simply had no clear memory of what had taken place. That he and the others were drunk virtually all of that week in St. Louis is supported by Isaac Galland, an exotic frontier character who practiced law and medicine, edited a number of newspapers, and speculated in land (it was Galland who sold Joseph Smith the site for the Mormon settlement at Nauvoo). Galland reported that the money paid to the Sauk and Fox upon signing the treaty was used to pay the Indians' grog shop bills and went on to observe, "The writer has no doubt, from his own personal knowledge of Quas-quaw-ma, that he would have sold to Gov. Harrison at that time, all the country east of the Rocky Mountains, if it had been required." Professor Cecil Eby of the University of Michigan has observed that had Harrison undertaken to transfer the Indiana Territory to the Sauk and Fox, his action would have been repudiated as that of a madman. The equally absurd cession by Quashquame and his companions of an area about as large as Massachusetts, Connecticut, and New Jersey combined, was serenely accepted by the United States as a legal and binding act. Having maneuvered a handful of drunken Indians into agreeing to a cession which they had no authority to make, Harrison took the further precaution of employing a bit of legal camouflage to ensure that nothing would upset the formalized larceny that he had planned. Article 7 of the treaty was cleverly designed to put to rest any troubling questions that might occur to Quashquame or his associates as they listened to the interpreter droning on: "Art. 7. As long as the lands which are now ceded to the United States remain their property, the Indians belonging to the said tribes, shall enjoy the priviledge [sic] of living and hunting on them." Like most American Indians, the Sauk and Fox had little or no concept of private land ownership. The tribe itself held dominion over their villages, fields, and hunting lands. It was natural that they would assume the same to be true with the Americans, and accordingly, Article 7 meant to them that, under American dominion, they could expect to live and hunt on the land forever. Unfortunately there was no pro bono lawyer present to point out that in fact it meant exactly the opposite. As soon as the government sold the land to settlers, the Indians would be evicted. Of course, had the draftsman of the treaty been concerned with clarity, he could have said just that. Clarity was not what the United States had in mind. Eby rightly calls the document signed that day "one of the most notable swindles in American history." When the Sauk and Fox tribal leaders learned what had taken place at St. Louis, there began a steady stream of Indian protests aimed at the treaty's irregularity and at the pitifully meager compensation it provided. Thanks to Article 7, there was little awareness shown of the fact that Quashquame and the others had put their mark to a paper which signed away the tribes' land forever. The question did not present itself squarely for most of the next two decades during which northwestern Illinois remained largely an unsettled wilderness, and the tribes continued to occupy their fields and villages undisturbed. Then, in the 1820s, development of the lead mines at Galena and Dubuque brought the first significant influx of whites to the Upper Mississippi Valley. With them came the familiar demands for westward removal of the Indians. Now, the Treaty of 1804 was trotted out, and there was no mistaking the American view of its meaning and effect. The land around Saukenuk was offered for sale, and Illinois Governor Ninian Edwards blustered, fulminated and threatened to loose his militia on the Sauk and Fox unless the Federal government saw to it that they were promptly moved out of the way of the lead miners, settlers, and land speculators who crowded the decks of the steamboats headed upriver from St. Louis. The pragmatic Sauk leader, Keokuk, saw no choice except to bow to the inevitable, and most of the Sauk and Fox sadly followed him across the Mississippi to Iowa, but a naive, courageous, and idealistic warrior who was woefully uninformed about the extent of American power, refused to concede. His name was Ma-ka-tai-me-she-kia-kiak, Black Sparrow Hawk, shortened by the whites to Black Hawk. He and his followers had fought for the British during the War of 1812 and had been known to the Americans ever since as the "British band" of Sauk and Fox. Eby, Cecil. "That Disgranceful Affair": the Black Hawk War. New York: W. W. Norton & Company, Inc., 1973. Hagen, William T. The Sac and Fox Indians. Norman: University of Oklahoma Press, 1958. Jackson, Donald, ed. Black Hawk: An Autobiography. Urbana: University of Illinois Press, 1955. Wallace, Anthony F. C. Prelude to Disaster. Springfield: Illinois State Historical Library, 1970. Whitney, Ellen M., ed. The Black Hawk War, 1831-1832, Collections of the Illinois State Historical Library XXXV-XXXVIII. Springfield: Illinois State Historical Library, 1970-78. Black Hawk's view of the Americans was expressed in his observation that the British made few promises but kept them faithfully; the Americans made many promises but kept none of them. Now, Black Hawk clung stubbornly to the belief that their homes and fields could not be taken from the Sauk and Fox by a piece of paper to which the tribes had never agreed. In 1831, he and his followers asserted their ownership of Saukenuk in outright defiance of the treaty and demanded that the whites leave. When they were confronted by 1,500 militiamen called out by another Indian-hating Illinois governor, John Reynolds, the outnumbered Indians slipped away in the night. The frustrated militiamen burned Saukenuk to the ground for consolation. Map of the territory acquired from the Sauk and Fox in the Treaty of 1804 as prepared by Ernest Royce. In Wisconsin, the acquisition stopped at the Wisconsin River. Map by Karen Everingham. The following spring, unwisely relying on the predictions of Wabokieshiek, the Winnebago Prophet, that the Winnebagos, Potowatomis, and even the British would come to his aid if he stood up to the Americans, Black Hawk determined to try again. On April 5, 1832, he led some 1,000 Indians, about half of them women and children, across the Mississippi to re-occupy Saukenuk and to plant corn for the coming season. There followed what we know as the Black Hawk War. It was not really much of a war. It began with the fiasco of Stillman's Run in which some forty or fifty Sauk warriors sent 275 panicked militia fleeing thirty miles across the Illinois prairie to Dixon's Ferry where the main American force was encamped. There, they breathlessly recounted their miraculous escape from thousands of bloodthirsty savages. Black Hawk was astonished at this unexpectedly easy victory, but he also knew that his plight was now even worse than before the encounter. The allies promised by the Prophet had not materialized. He was burdened with hundreds of women and children. There was little or nothing to eat except what could be gathered or obtained by hunting and fishing while fleeing from a pursuing army, and that army—now embarrassed and more determined than ever to punish him—refused to allow him to surrender. Indeed, Stillman's Run had been precipitated by the first of what were to be many futile attempts at surrender. The remainder of the "war" was little more than the pursuit and hunting down of a dwindling band of starving, miserable Indians who kept trying to surrender but whose pursuers either did not understand or did not want to understand. It ended where Wisconsin's tiny Bad Axe River joins the Mississippi, some thirty miles north of Prairie du Chien. 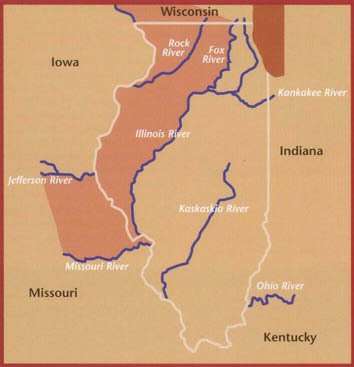 There, many of the remnant of Black Hawk's band were slaughtered as they tried to get across the river to the west where the Americans presumably wanted them to be. That no longer mattered. No one was spared. Braves, old men and women, and mothers in the water with their infants lashed to their backs as they tried to swim to safety were all fair game for the troops on the bank and for the steamboat Warrior cruising up and down the shoreline blasting away with its six-pounder cannon. Nor was there any sanctuary for the few who managed to make it across. They were hunted down by the Sioux who had been commissioned by the Americans to make sure that no one escaped. The massacre at the Bad Axe River was the final act in the tragedy that had begun twenty-eight years earlier with William Henry Harrison's unconscionable Treaty of 1804. While it differs only in detail from dozens of other instances of egregious mistreatment of the American Indian, it needs to be remembered as an example of what we did to those unfortunate people who had the bad luck to find themselves in the path of Manifest Destiny.